Read This Free Report Before Hiring An Animal Communicator! * How to find a good, qualified animal communicator practitioner? * When you should ask an animal communicator for help? * When it’s okay to be skeptical and how to use your skepticism to help you and your animals? * What questions you should ask a practitioner BEFORE you hire them? * How to determine if the practitioner is qualified to help you — or are they a quack? * What to expect from a consultation with an animal communicator? * How to get the most from your session? Why do you need to know more about animal communication? You know your animals have secret lives, thoughts, feelings and wisdom. Animal communicators are trained to be able to hear them, understand them, communicate with them so they share their innermost thoughts. But before you go any further, you need to know some critically important things. Because this is such an unusual profession, I want to help you get started right. Animal communication has become very mainstream these days as more folks are aware of telepathic communication between humans and animals. In fact, it is currently practiced by millions of people the world over!! Get your copy of my Free Special Report now! Just enter your name and email address below. 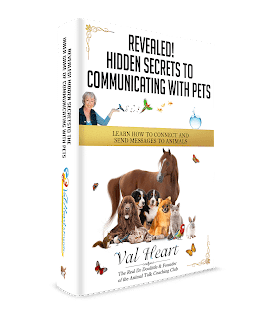 NOTE: With your Free Report comes the Gift of Val’s Expert Animal Communication eTips Course PLUS a Complimentary Subscription to Val’s Animal News eNewsletter! WE HATE SPAM! Your information is NEVER shared with anyone else, period. Who am I and why should you consider working with me? Since 1993 I have managed a successful expert animal communicator and alternative holistic healing practice. I’ve worked with over 6,000 animals and their owners, trainers and even veterinarians all over the nation. I love helping them accomplish their goals with health, performance, training & behavior modification. An empathic animal behaviorist and professional animal communicator, I also specialize in alternative energetic healing and bodymind balancing for animals and their people. A lot of folks come to me after having worked with other communicators… and they’ll tell me things like: they only were told what they already knew, it wasn’t helpful, nothing changed, or worse, they were told things they knew weren’t true… and they were not very happy with their experience. Start resolving any problem by discovering what the real issues are — by asking your animals what their viewpoint is. And sometimes you get lucky and find answers, and other times, you are no better off than when you started! You can even make things worse if you don’t take the time to communicate with them first. I always believed that animal communication was the best place to start resolving any problem. After we know what the REAL issues are according to your animal’s, THEN we can work to resolve things. I differ from many animal communicators in that I specialize in “what’s next”. And depending on what’s needed, I can also do energetic healing, counseling, negotiating or identify what other modalities are needed. I’ve always felt that talking with our animal companions is the first step, but that what’s really needed and wanted (by you and your animal!) is how to best resolve the problem, whatever it is. Animals are spiritual teachers. In every relationship with an animal teacher, they are talking to you all the time. The question is: Do you know how to listen to them? Can you hear and understand what they are saying to you? Many companion animals choose to spend their lives attempting to break through your barriers, help you heal and become reconnected with all Life. The Gift of Animal Communication gives them a voice. Start resolving any problem by inviting your animal’s participation, giving them a voice so they can tell you how they feel, when the problem started, what helps, what makes things worse, and what they really want or need… Often the answers are as simple as learning to listen to their wisdom, see life from their viewpoint. BE SURE AND WHITELIST MY DOMAIN NAME! You will be redirected to another webpage when you hit Submit, and you will also be sent an email with the links and instructions for accessing this Special Free Report. IF YOU ARE NOT REDIRECTED, please check your email box. If you do not see the confirmation email pretty soon, be sure and check your junk and spam filters. If you still don’t find your information, then please contact us. I will be sending you your confirmation email with links and your Special Report to your email address. When you hit Submit, you will be added to my email list of friends. You are welcome to Unsubscribe out of my list at any time. Instructions for Unsubscribing or Updating your information will be included in every email. Learn more about how you can learn to communicate with animals yourself!